Many African natural products have been hypothesized to have phytochemicals that makes them effective anti-tumour agents. This research study looks at two out of the numerous hypothesized medicinal plants-Curculigo pilosa and Ganoderma lucidum. Caspase-3, Neutral red and DNA fragmentation assays were carried out on HeLa cell lines cultured in Dulbeccos Modified Eagles Medium (DMEM) in (95% O2 + 5% CO2) at 35°C. The apoptotic, cytotoxic capacities and DNA fragmentation assays were carried out on the medicinal plants. Both plant samples were extracted in both organic (mixture of ethanol and ethylacetate in the ratio 50:50) and aqueous solution (mixture of methanol and distilled water in the ratio 70:30). It was observed that both plant samples had apoptotic effects but below 50% of comparative levels with the exception of the aqueous extract of Ganoderma lucidum which could pass as an antitumour agent (showing apoptotic effect above 50%). Conclusively, the aqueous extract of Ganoderma lucidum proves to be suitable for the development of an antitumour agent as shown by its apoptotic effect reported in this study. Samuel Titilola Aderonke, Odesanmi O. Selina, James Ayorinde Babatunde, Tafida Mundi and Olubunmi A. Magbagbeola, 2013. Cytotoxic and Apoptotic Potentials of Ganoderma lucidum and Curculigo pilosa on Human Cervical Adenocarcinoma Cell Line, HeLa. Journal of Biological Sciences, 13: 88-93. Complementary and Alternative Medicine has gained popularity for the treatment of cancer cases in both developed and developing nations (Olaku and White, 2011). However, current chemotherapeutic drugs are effective but they are associated with severe adverse effects and drug resistance. One possible way to increase the efficacy of anticancer drugs and to decrease toxicities is to develop effective traditional medicines especially from plants (Greenwald, 2002; Li et al., 2007; Dai et al., 2008). Several herbs and plants with various pharmacological active compounds may have potential for the prevention and/or treatment of several human cancers. The anti-oxidant prowess of flavonoids in medicinal plants possess a variety of anticancer effects such as cell growth arrest, kinase activity inhibition, induction of apoptosis, suppression of matrix metalloproteinases secretion and reduction in tumour-invasive behaviour (Chau et al., 2000). This study looks at two of the numerous Nigerias medicinal plants:- Ganoderma lucidum (Polyporaceae) and Curculigo pilosa. Ganoderma lucidum has a long historical usage as medicinal plant dating back to four thousand years (Zhao and Zhang, 1994; Ajith and Janardhanan, 2007). In Japan it is called Reishi and in China and Korea it is variously called Ling Chu and Ling Zhi (Mushroom of immortality) (Ajith and Janardhanan, 2007). It is called by the Yorubas in Nigeria Olu-iju. Oyetayo (2011) reported that G. lucidum is used in treating asthma and neoplasia in his review on ethnomedicinal uses of some mushrooms in Nigeria. In Southern India, extracts from fruiting bodies and mycelia of G. lucidum were found to possess in vitro antioxidant activity and antimutagenic activities (Jones and Janardhanan, 2000; Lakshmi et al., 2003). Asides from its reported immunomodulatory activity (Zhao et al., 2012), many reports showed that G. lucidum has anti-proliferative effect on many cancers such as acute myelogenous leukemia (Chui et al., 2006), lung cancer (Kashimoto et al., 2006), breast cancer (Yue et al., 2006), colorectal cancer (Xie et al., 2006), bladder cancer (Lu et al., 2004) and prostate cancer (Jiang et al., 2004; Cheng et al., 2007). Treatment of prostate cancer PC-3 cells with Traditional Botanical Supplement-101 (TBS-101), a botanical agent containing standardized botanical extracts of Panax ginseng, cranberry, green tea, grape skin, grape seed, Ganoderma lucidum and chamomile resulted in dose dependent inhibition of cell growth with concomitant induction of apoptosis (Khan and Mukhtar, 2010). The rhizomes of Curculigo pilosa (Hypoxidaceae) have been hypothesized to possess anti-tumour abilities in South-Western region of Nigeria. It has been reported to treat the following leukemia, gonorrhoea, cough, purgative, astringent, aphrodisiac, demulcent as documented in the plant database. Soladoye et al. (2012) reported its use as an antidiabetic; the vasoconstrictive activity of its benzyl benzoate and norlignan glucosides was also reported (Palazzino et al., 2000; Cometa et al., 2001). This study aimed to assess the comparative cytotoxic and apoptotic effects of the aqueous and organic extracts of Ganoderma lucidum and Curculigo pilosa which are commonly used medicinal plants in south western part of Nigeria. Duration of study: This work was done between the space of five months which commenced in May, 2010 and ended in August, 2010. Plant collection: Fruiting body of G. lucidum (Olu-iju) and the rhizome of Curculigo pilosa (Epakun) were purchased from the local herb market in Mushin Area of Lagos State, Nigeria. Sample specimens were identified at the Department of Botany, University of Lagos. The plant materials were washed and oven dried at 40°C to remove moisture. Aqueous and organic extraction: Five hundred grams of dried samples were pulverized and 100 g of powdered samples were dissolved in 300 mL of an organic mixture of ethanol and ethylacetate (50:50) in a 2 L volumetric flask. The flask was agitated for 18-22 h and the solutions were poured through low ash filter paper into round bottom flasks for rotary evaporation at 40°C which was labelled organic extract. The insoluble material in the low ash filter paper and the funnel was returned into a 2 L volumetric flask containing a mixture of methanol and distilled water (70:30). The volumetric flasks were then agitated for 22 h after which the solutions were poured through low ash filter papers and funnels into appropriately labeled round bottom evaporator flasks. The extract was concentrated to 20 mL and subsequently lyophilized (Eldridge et al., 2008). Tissue culture and extracts testing: HeLa cell line was cultured in DMEM (Dulbeccos Modified Eagles Medium) with 10% Fetal Calf Serum (FCS) at 37°C and 95% O2/5% CO2. At 90% confluence, 0.05x106 cells was seeded into each well of 24 well plates and 35000 cells was seeded in each well of 96 well plates for cytotoxicity and apoptosis assays. A stock of 40 mg mL-1 of the individual aqueous and organic extracts of G. lucidum and C. pilosa were prepared in 0.5% ethylacetate. The stock was then used to prepare test concentrations of 8-0.5 mg mL-1 in DMEM. Caspase 3 Assay: Caspase 3 enzymatic activity was quantified by the spectrophotometric detection of p-nitroanilide (pNA) chromophore after cleavage from the labelled substrate DEVD-pNA at 405 nm. HeLa cells were plated into 24 well plates and tested for 6 hrs with varying concentrations (8-0.5 mg mL-1) of the extracts in triplicates. Total protein content was determined using Bradford method. One hundred and fifty microgram protein was used for the determination of the relative increase of caspase-3 activity as described in the assay kit (Genscript® Caspase-3 Colorimetric Assay Kit). DNA fragmentation assay: Testing was carried out with 8 mg mL-1 of the extracts. After treatment, cells were washed with PBS then lysed with cold lysis buffer TE (10 mM Tris, pH 7.4, 5 mM EDTA, 0.2% Triton X). The lysates were centrifuged at 27000 g for 25 min, the supernatant was treated with phenol: chloroform: isoamyl alcohol (25:24:1, v/v/v) containing 0.1% (w/v) hydroxyquinoline and DNA was extracted from the aqueous phase of the mixture. DNA was precipitated with cold 70% (v/v) ethanol and dried. Precipitates were dissolved in TE buffer containing 10 mg mL-1 RNAse and incubated at 37°C for 30 min. The DNA pellet was washed with 3 M sodium acetate and cold 70% ethanol and kept at -20°C for 1 h. The pellet was rinsed with 70% ethanol and air dried for 10 min. Washed pellet was dissolved in 30 μL TE buffer; 10 μL of the sample was loaded unto 1.2% agarose gel containing 0.05 μg mL-1 ethidium bromide and ran at 5 V for 5 min before increasing to 100 V. Image was analysed with BioDoc image analyzer (Khalafalla et al., 2009). 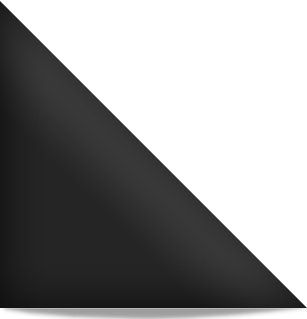 Calculations and statistical analyses: All calculations and statistical analyses were done using the computer software GraphPad Prism® 5. Values from cytotoxity and apoptotic assays were expressed as relative cell death in percent. Two-way analysis of variance (ANOVA) using Bonferroni post test to compare apoptosis and cytotoxicity in HeLa cells at different extract concentrations (N = 3) was done. A p-value of less than 0.05 was considered significant. The inhibition of neoplasia without toxicity to normal cells has attracted attention as an important target in cancer therapy (Li et al., 2009). More than half of the new chemicals approved between 1982 and 2002 were derived from medicinal plants (Newman et al., 2003; Tan et al., 2011). Tan et al. (2011) reported several anti-cancer natural products isolated from Chinese medicinal herbs. This initiative in Nigeria would also be of immense benefit to further isolate and purify new lead compounds or bioactives with efficacious anti-cancer property. Literature is yet to report on the anti-neoplastic effect of C. pilosa but in our findings, the organic extract of C. pilosa in the study caused a concentration dependent increase in cytotoxicity and apoptosis (Fig. 1a) which both shows a relative cell death (%) that is lower than 50%. Nonetheless, a higher significant (p<0.01) relative cell death was recorded for apoptosis than cytotoxicity at 2 mg mL-1 test concentration (Fig. 1a). The aqueous extract of Curculigo pilosa shows more of significant (p<0.01) cytotoxic deaths than apoptosis in which both (Fig. 1b) exhibited higher relative cell deaths in comparison with the organic extract (Fig. 1a). This gives a good indication that further work might be necessary to further purify the aqueous extract in order to see if its cytotoxic effect could have beneficial uses. On the other hand, various research works have been done on G. lucidum and it has also been reported that G. lucidum has been used in traditional Chinese medicine as an anti-tumour medication or as an immunomodulator (Sliva et al., 2002). The biologically active compounds isolated and purified from G. lucidum were identified as polysaccharides and the main fraction was designated as branched (1>3)-β-D-Glucans (Sone et al., 1985; Sliva et al., 2002). The polysaccharides were able to induce the expression of IL-1, IL-6, IL-12, IFN-γ, TNF-α, GM-CSF, G-CSF, M-CSF in monocytes-macrophages and T-lymphocytes which might, in part, mediate some of their anti-tumor activity (Muller et al., 2006). Figure 1c shows low cytotoxic and apoptotic effects of the organic extract of G. lucidum whereas the aqueous extract of G. lucidum possess both cytotoxic and apoptotic effects with the apoptotic effect rather higher than the cytotoxic effect as shown in Fig. 1d and 2. 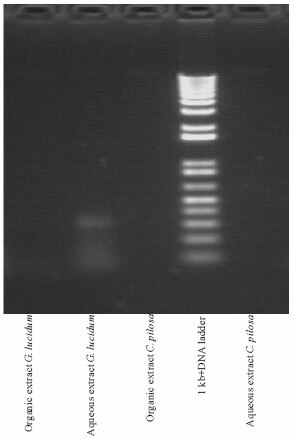 These findings corroborates previous works by showing the effect of pro-apoptotic effect of the aqueous methanolic extract of G. lucidum on human cervical adenocarcinoma cell line (HeLa) as depicted by the hallmark of apoptosis test-DNA fragmentation (Fig. 2). More so many reports have showed G. lucidum extracts to possess anti-proliferative effects on many cancers, such as acute myelogenous leukemia (Chui et al., 2006), lung cancer (Kashimoto et al., 2006), breast cancer (Yue et al., 2006), colorectal cancer (Xie et al., 2006), bladder cancer (Lu et al., 2004) and prostate cancer (Jiang et al., 2004). From our findings, the aqueous extract of G. lucidum showed more promise as a pro-apoptotic natural agent in comparison with C. pilosa extracts which only had a cytotoxic effect. This encourages further developmental research into the various phytochemicals present in the aqueous portion of Ganoderma lucidum as a proposed future anti-cancer agents. Ajith, T.A. and K.K. Janardhanan, 2007. Indian medicinal mushrooms as a source of antioxidant and antitumor agents. J. Clin. Biochem. Nutr., 40: 157-162. Chau, B.N., E.H.Y. Cheng, D.A. Kerr and J.M. Hardwick, 2000. Aven, a novel inhibitor of caspase activation binds Bcl-xL and Apaf-1. Mol. Cell, 6: 31-40. Chui, C.H., R.S. Wong, G.Y. Cheng, F.Y. Lau and S.H. Kok et al., 2006. Antiproliferative ability of a combination regimen of crocodile egg extract, wild radix ginseng and natural Ganoderma lucidum on acute myelogenous leukemia. Oncol. Rep., 16: 1313-1316. Cometa, M.F., G. Palazzino, C. Galeffi and M. Palmery, 2001. Studies on vasoconstrictor activity of Curculigo pilosa extracts and of its isolated compounds. II Farmaco, 56: 353-356. Dai, Z.J., X.J. Wang, Z.F. Li, Z.Z. Ji and H.T. Ren et al., 2008. Scutellaria barbate extract induces apoptosis of hepatoma H22 cells via the mitochondrial pathway involving caspase-3. World J. Gastroenterol., 14: 7321-7328. Eldridge, G., L. Zeng, P. Cremin, C. Lee, H.C. Vervoort and M. Ghanem, 2008. Screening of chemical compounds purified from biological sources. United States Patent No. 20080255001. http://www.freepatentsonline.com/y2008/0255001.html. Fotakis, G. and J.A. Timbrell, 2006. In vitro cytotoxicity assays: Comparison of LDH, neutral red, MTT and protein assay in hepatoma cell lines following exposure to cadmium chloride. Toxicol. Lett., 160: 171-177. Greenwald, P., 2002. Cancer chemoprevention. Br. Med. J., 324: 714-718. Jiang, J., V. Slivova, T. Valachovicova, K. Harvey and D. Sliva, 2004. Ganoderma lucidum inhibits proliferation and induces apoptosis in human prostate cancer cells PC-3. Int. J. Oncol., 24: 1093-1099. Jones, S. and K.K. Janardhanan, 2000. Antioxidant and antitumor activity of Ganoderma lucidum (Curt. : Fr.) P. Karst.-Reishi (Aphyllophoromycetideae) from South India. Int. J. Med. Mushrooms, 2: 195-200. Kashimoto, N., M. Hayama, K. Kamiya and H. Watanabe, 2006. Inhibitory effect of a water-soluble extract from the culture medium of Ganoderma lucidum (Rei-shi) mycelia on the development of pulmonary adenocarcinoma induced by N-nitrosobis (2-hydroxypropyl) amine in Wistar rats. Oncol. Rep., 6: 1181-1187. Khalafalla, M.M., E. Abdellatef, H.M. Daffalla, A.A. Nassrallah and K.M. Aboul-Enein et al., 2009. Antileukemia activity from root cultures of Vernonia amygdalina. J. Med. Plants Res., 3: 556-562. Khan, N. and H. Mukhtar, 2010. Cancer and metastasis: Prevention and treatment by green tea. Cancer Metastasis Rev., 29: 435-445. Lakshmi, B., T.A. Ajith, M. Sheena, G. Nidhi and K.K. Janardhanan, 2003. Antiperoxidative, anti-inflammatory, and antimutagenic activities of ethanol extract of the mycelium of Ganoderma lucidum occurring in South India. Teratogenesis Carcinog. Mutagen., 23: 85-97. Li, W.Y., L.C. Chiu, W.S. Lam, W.Y. Wong and Y.T. Chan et al., 2007. Ethyl acetate extract of Chinese medicinal herb Sarcandra glabra induces growth inhibition on human leukemic HL-60 cells, associated with cell cycle arrest and up-regulation of pro-apoptotic Bax/Bcl-2 ratio. Oncol. Rep., 17: 425-431. Li, Z.F., Z.D. Wang, Y.Y. Ji, S. Zhang, C. Huang, J. Li and X.M. Xia, 2009. Induction of apoptosis and cell cycle arrest in human HCC MHCC97H cells with Chrysanthemum indicum extract. World J. Gastroenterol., 15: 4538-4546. Lu, Q.Y., Y.S. Jin, Q. Zhang, Z. Zhang and D. Heber et al., 2004. Ganoderma lucidum extracts inhibit growth and induce actin polymerization in bladder cancer cells In vitro. Cancer Lett., 216: 9-20. Muller, C.I., T. Kumagai, J. O'Kelly, N.P. Seeram, D. Heber, H.P. Koeffler, 2006. Ganoderma lucidum causes apoptosis in leukemia, lymphoma and multiple myeloma cells. Leuk. Resrh., 30: 841-848. Newman, D.J., G.M. Cragg and K.M. Snader, 2003. Natural products as sources of new drugs over the period 1981-2002. J. Nat. Prod., 66: 1022-1037. Olaku, O. and D.J. White, 2011. Herbal therapy use by cancer patients: A literature review on case reports. Eur. J. Cancer, 47: 508-514. Oyetayo, O.V., 2011. Medicinal uses of mushrooms in Nigeria: Towards full and sustainable exploration. Afr. J. Traditional Complementary Altern. Med., 8: 267-274. Palazzino, G., C. Galeffi, E. Federici, F.D. Monache, M.F. Cometa and M. Palmery, 2000. Benzylbenzoate and norlignan glucosides from Curculigo pilosa: Structural analysis and In vitro vascular activity. Phytochemistry, 55: 411-417. Sliva, D., M.T. Rizzo and D. English, 2002. Phosphatidylinositol 3-kinase and NF-κB regulate motility of invasive MDA-MB-231 human breast cancer cells by the secretion of urokinase-type plasminogen activator. J. Biol. Chem., 277: 3150-3157. Soladoye, M.O., E.C. Chukwuma and F.P. Owa, 2012. An avalanche of plant species for the traditional cure of Diabetes mellitus in South-Western Nigeria. J. Nat. Prod. Plant Resour., 2: 60-72. Sone, Y., R. Okuda, N. Wada, E. Kishida and A. Misaki, 1985. Structure and antitumor activities of the polysaccharide isolated from fruiting body and the growing culture of mycelium of Ganoderma lucidum. Agric. Biol. Chem., 49: 2641-2653. Xie, J.T., C.Z. Wang, S. Wicks, J.J. Yin and J. Kong et al., 2006. Ganoderma lucidum extract inhibits proliferation of SW 480 human colorectal cancer cells. Exp. Oncol., 28: 25-29. Yue, G.G.L., K.P. Fung, G.M.K. Tse, P.C. Leung and C.B.S. Lau, 2006. Comparative studies of various Ganoderma species and their different parts with regard to their antitumor and immunomodulating activities In vitro. J. Altern. Complement Med., 12: 777-789. Zhao, J.D. and X.Q. Zhang, 1994. Resources and taxonomy of Ling Zhi (ganoderma) in China. Proceedings of the International Symposium on Gganoderma Research, October 24-26, 1994, Bejing Medical University, Beijing, China -.